This post has been a long time in coming. Way back when we started drinking wine at home with some decent wine glasses, we would wash the glasses and then just set them upside down on a towel. The end result of course was water spots on the glasses and that just doesn’t look good. Somebody had to wash AND dry the glasses and who do you think got that job? Yeah, you’re right, me. 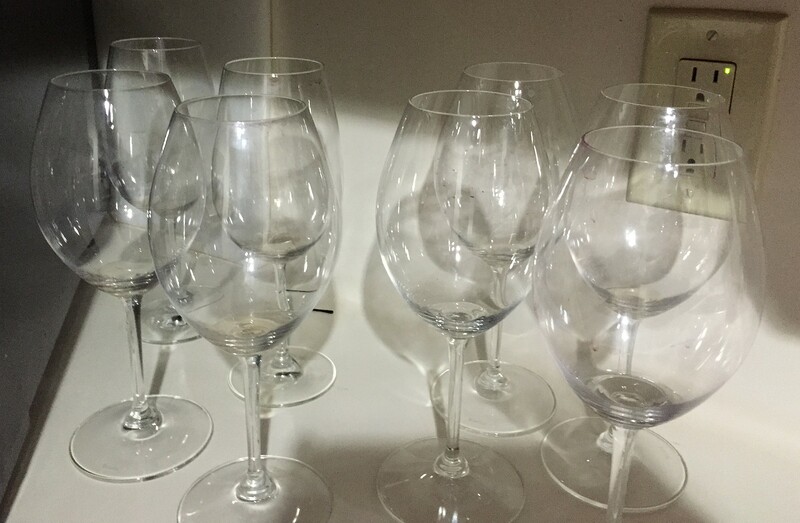 After an evening of drinking wine, I did not want to take a chance cleaning the glasses and breaking them, so they would end up multiplying like rabbits. Do you have this same problem? 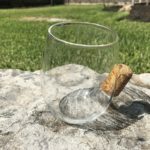 Over time I have tried many methods recommended online, by friends, and nothing was ever the foolproof and easy way to clean and dry wine glasses. We needed to buy a new dishwasher last year and I was like, “Yeah! Now we can get a dishwasher that will work great for wine glasses and then I’m out of hand washing.” We bought a new dishwasher with reviews saying it would work fine with wine glasses and it also had an advantage with a top rack that could be lowered so it would handle tall wine glasses. Sadly, even with a recommended wine glass detergent tried various ways with heat dry, air dry, other dishes in, etc., nothing came out perfect. 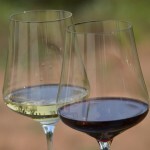 The only wine glasses that would come out close to perfect were the small tasting glasses which came from wineries. But since those are not our primary wine glasses to use, that wasn’t satisfactory. Back to hand washing. I then began my search for the tools that would work for me. 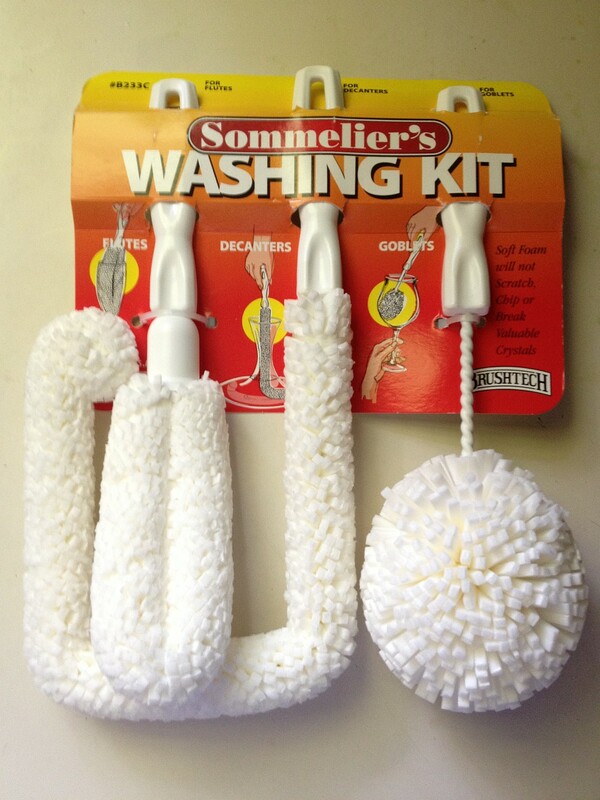 The first search was looking on Amazon where I came across the Sommeliers Washing Kit. This sounded good so I bought one. The primary brush I planned on using was too big for all the glasses we used. It’s called a goblet brush for a reason. For smaller glasses, it would not fit which left only the flute brush to use. 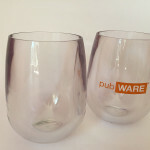 This was great for flutes, but just didn’t make the grade for regular wine glasses. I then thought of trying what I had been using for years, the Dawn Twister Bottle Brush. This was great! The bristles were gentle enough and would squeeze into any size wine glass if needed. I highly recommend getting one of these brushes for cleaning your wine glasses. You can order online at Amazon or you may be able to find it at your local supermarket. Next was a decision if I should use dish detergent or not. A lot of places recommended using just hot water, but when you have a grimy red stained glass from either red wine or lipstick, I personally don’t think hot water is good enough. But you do not want a detergent with fragrances. 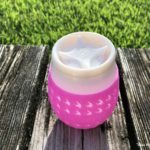 There are a lot of fragrance free products out there, but I was surprised it was tough to find a dish detergent that was fragrance free. 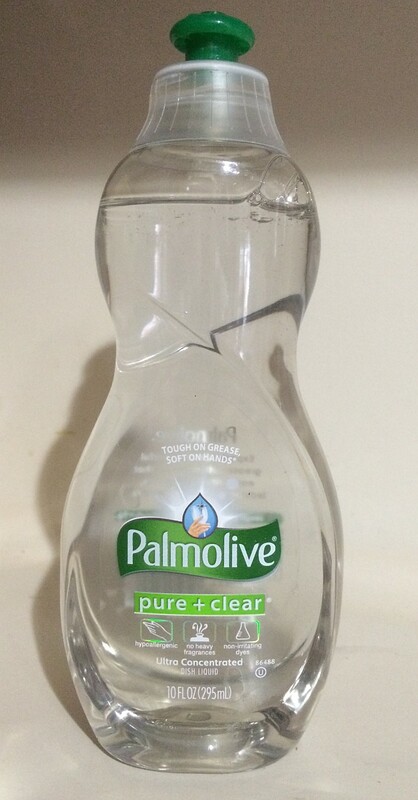 I then came across the Palmolive Pure + Clear Dish Liquid. As the bottle says, there are no heavy fragrances, and I can attest to that. So I decided to go with this detergent to get our wine glasses clean. After washing glasses, you need to dry them, and so the search for the best towel to dry them began. I tried all kinds of towels and surprisingly, those towels that your grandmother used and never seemed to dry anything, were the best ones I found. 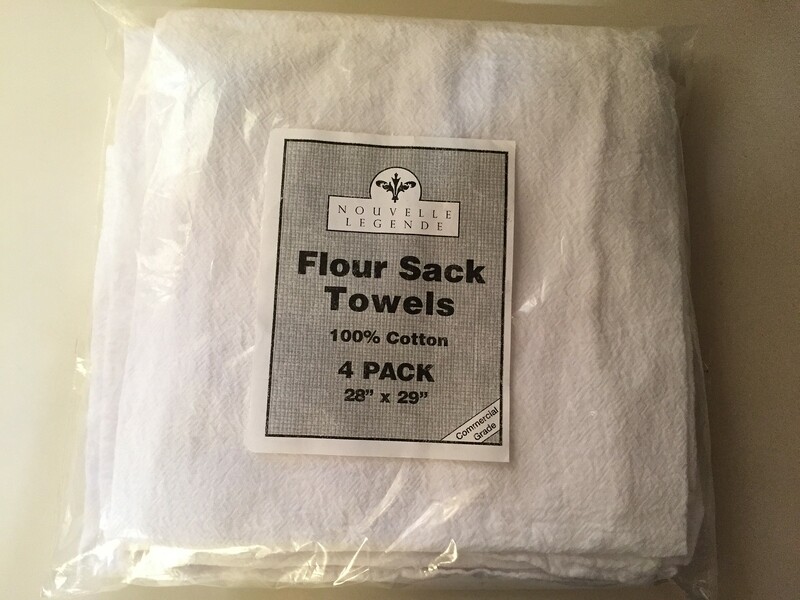 The “proper” name for those are flour sack towels, so I bought some towels on Amazon. I was now complete with all the tools necessary to finally reveal my foolproof method for washing and drying wine glasses. Or so I thought. I was told about this miracle towel just before writing this and had to find one. Searching online again proved to be a challenge because it was sold out of most online stores. But I persevered and found one on Amazon. The price was a little high, but I ordered one Crystal Shine microfiber cloth. It arrived last week and I have only used it once on five glasses, but already I am in love! This towel just keeps drying even after it gets wet, and then it seems to do even better. I am hoping my continued use of it continues to be great. If not, I will go back to the flour sack towels. 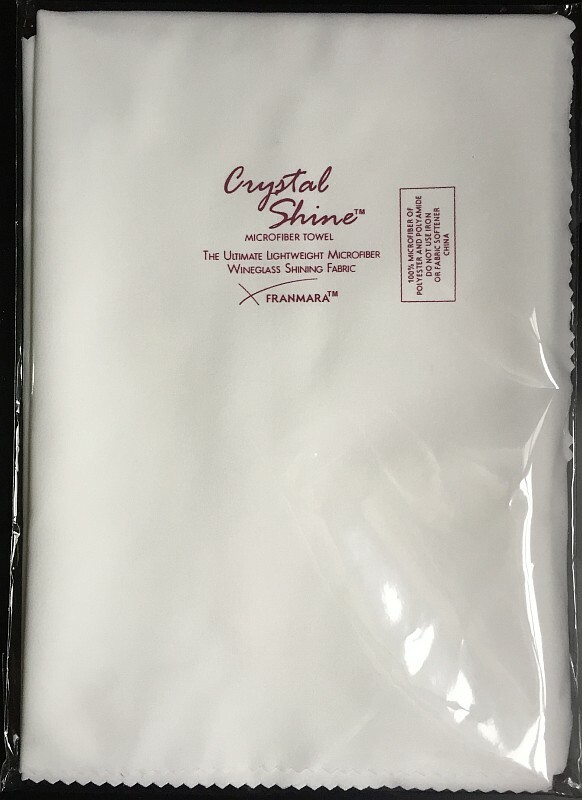 Update: I am still in love with the Crystal Shine microfiber cloth, and so much so, that I have bought a second one too for those times when I have a lot of wine glasses to wash! What follows is my perfected method for hand washing and drying wine glasses. 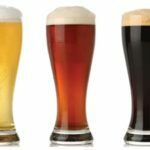 First, line all those glasses up in the sink, and put a drop of dish detergent in the first one. It’s amazing how one drop just fills the glass, so you definitely don’t need more than a drop. 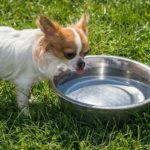 Use the hottest water from the faucet that you can stand. If you need to, you can use dishwashing gloves. Fill up the first glass with the water until the soap reaches the rim. Now pick up a glass and hold it at the base of the bowl. 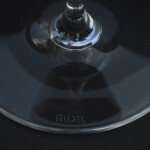 Don’t hold it by the stem or the very bottom of the wine glass, otherwise you could end up breaking it. This holding position will be the place for all your washing and drying. Get the Dawn brush out and run it around inside the glass and on the outside of the glass. You need to be more delicate if washing the stem and base, but personally I don’t use the brush for those areas. Sometimes you might still have some of that red stain left around the rim of the glass and if you do, just take your fingers and wipe it around inside and out of the rim and they should be gone. With the first glass washed, take the excess soap and water and pour it into the next glass. That way you’re just using the minimal soap needed and I have gone through many glasses with just that one drop from the first glass. Time to rinse the glass. Get the hot water running and holding the wine glass by the bowl again, just spin it around under the faucet stream. This part is actually kind of fun as you’ll soon develop the technique to rinse it out while spinning the wine glass. Update: I have further developed my technique in the wash and dry process. We usually end up with many glasses to wash and dry, and my new improvement helps speed up the process. Everything stays the same, except the order in which it is done. What I do now is wash and rinse the glasses. Then I turn them upside down on a towel, and then complete the wash and rinse steps for every wine glass. I then turn toward drying every wine glass. A lot of times, the water is less on the wine glass at that point which makes drying and buffing a lot faster. And since you are only doing drying, the whole process is sped up. Drying time. 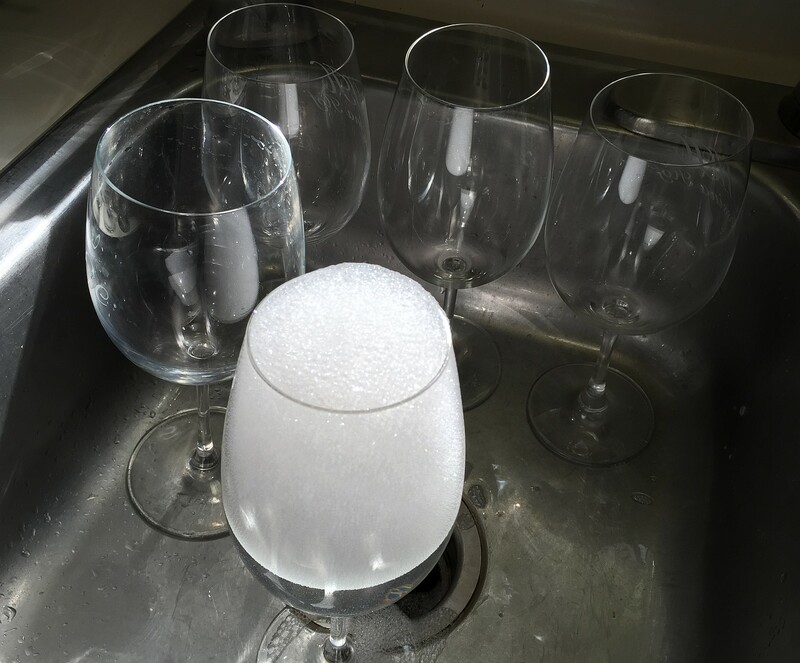 Take the wine glass and shake out any excess water from within the wine glass. Get your preferred towel and dry the outside of the glass. Don’t worry, you’ll come back to finish the outside later. Now for the inside of the wine glass. Do one last shake to get any remaining water from inside the glass and then push the towel down inside the glass. 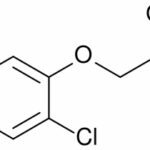 Here’s where my method differs from others and I have seen a lot of people drying glasses at a wine conference. 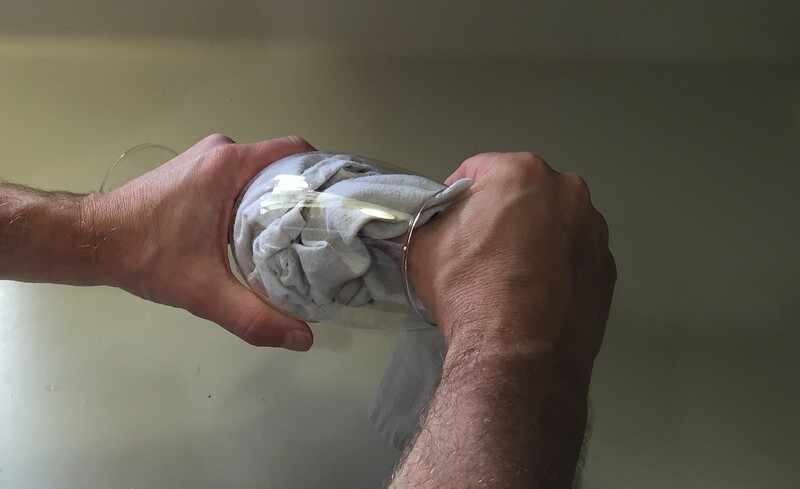 Instead of inserting a couple of fingers inside the glass to twist the towel around, just insert your thumb. If you have enough towel inside the glass, your thumb should be able to move the towel around inside the glass and you won’t get the bottom of your fingers blistered. If you hold your towel correctly on the outside of the wine glass, none of your fingers will actually touch the glass. Move the towel around a few times inside the glass. Secret method number two now. Take out the towel and insert it back in. If you looked at the glass when you pulled it out, there was most likely still some wet areas inside the glass. By inserting the towel a second time and repeating the same process, there’s an excellent chance you will have hit those wet areas. Take out the towel and if you followed the directions, the only thing on the outside of the wine glass you touched was the base of the bowl. Use the towel to polish up anything you see by holding the wine glass up to a light. That’s it! You should now have a spot free wine glass. If you do have a wine glass with water spots, you can use the method described and it might take a couple times to get rid of those spots. Another tip is to boil some water and then use the steam from the water (just hold the glass over the water) and it will help to get those water spots out. Hopefully I gave you some good tips so your wine glass cleaning will be easier next time. Cheers! Very informative! I shared on Twitter! You’re welcome. Definitely don’t use fabric softener or sheets on any of these cloths for wine glasses. ?